I am trying to understand the changes to the gold price. The justification given is that the GPB-USD fluctuation. But Travian Games is based in Germany so the GBP-USD exchange rate appears to be irrelevant?!? 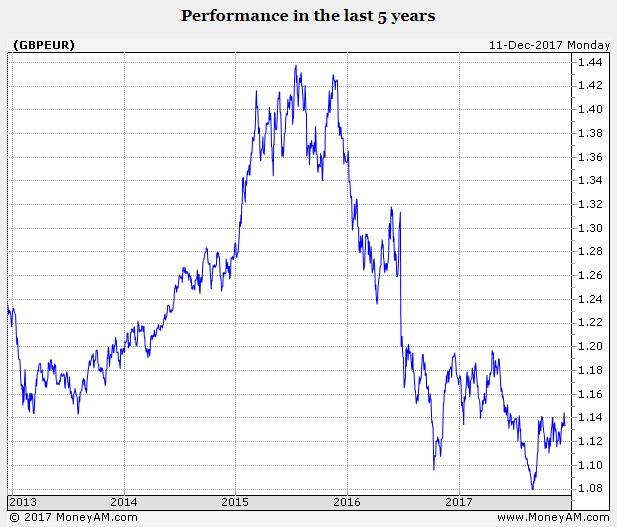 If you look at the GPB-EUR fluctuation over the last 5 years (the period given in the justification), you can see that over these 5 years that the exchange rate is basically constant (below). Actually, it has gone down slightly. In fact, 2 years ago, the exchange rate went up to 1.4 which meant that TravianGames was getting 82% more earnings on foreign exchange from UK servers. At this time they did not discount gold due to currency fluctuations. Can I please have a response about this discrepancy as I do not understand the justifications given for the 12% increase in gold based on realising the foreign exchange difference over the period stated. I have also checked an inflation justification. The inflation in Germany over the last 5 years (cumulative) was 7.49%. If you take the current exchange rate between the GBP and the Euro and multiply it by 7.49%, you arrive at a figure that is (just) less than the 5 year exchange rate. So this does not justify the 12% increase either? Ok, i could say i'm happy with the price increase, but i want something in return. NPC to cost 2 gold instead of 3. Make the Travian Plus cost 8 gold per week to extend. When did a gold promo last time was? How about a 50% off gold promo? i don't want to sound too silly but how about 75% off? When people leave,... there is no coming back. I am not here to argue any stats or facts based on the post about the price increase. It is way over my rank and not part of it. I do want to say though that your feedback is being watched and read. I will also add that posts that are only to flame or are posted with rumors or unfounded accusations will be removed without notice. Discussion is a great thing as it is communicating but creating stories where none exists will be removed. Thanks for the brief interruption. What rumours, flames or unfounded accusations have there been that its warranted to make that warning? Feels more like you're warning us to shut up. Trust me to post in a thread without reading it! Not happy, as Cretin has said the rates do not justify the change. A £5 increase on a large packet is insane! You cannot void inflation and then proceed to accumulate it in one. Basic knowledge! I will be back with stats and figures and more furore once the footy is over! P.S. I assume this is why Matt stepped down? He wanted no part in it? I have to disagree with you there boxx. The game has changed :p , if it hadn’t however we might not be in this situation to begin with. I have removed one post already accusing Travian of creating things that they are not. This thread was started by the community and will remain as you do have a right to express yourselves about changes that Travian makes. All I ask is that the posts are not just flaming or trolling. Why don't you fix your game before charging more? The Last Month has seen a huge increase in issues. The Unlimited wheat bugs on Comx, The 100% Troop Recruitment Bonus on Ukx, The Artefacts and plans not releasing when expected. You expect people to pay More For what is no longer a fully functioning game? Great Job at driving people away, A Development Team that can't develop and a marketing team that can't market. No sense of timing. I am really just dumfounded about the decision making process. The economics of supply and demand say that justifying an increase in cost-of-goods requires an increase in demand. We are obviously seeing the opposite when we look at player numbers. Increasing the price will only lower player numbers, creating a vicious cycle. It is tempting to increase price to increase revenue, but this is not how supply-demand works...To increase demand, incentives need to be provided that make players want to take up the game. This can be in many forms. Increased demand "means that consumers wish to purchase more of the good at every price". Only when you see increased demand can you justify increasing the price without sacrificing revenue. They make plenty but they don't give a monkeys about their customers, never have, never will. They basically just killing their own game off. Is this change UK based? If it is USD vs GBP then how does the gold cost on .US servers fair in comparison? We were looking at doing a .US server already, maybe we all go there. The losses from transferable gold across a server being lost may still work out cheaper. I feel like this all be revenge for us taking the mickey out of he 2 weeks free Travian plus!